Ricky Gervais with Constantine the Kermit copy. The Muppets have aged incredibly well. Not just physically. (Elliott Gould was in their 1979 feature debut and have you seen that guy lately?) But comedically. Instead of appealing to successive generations of children like some puppet Peter Pans, they've grown up with their boomer audience. 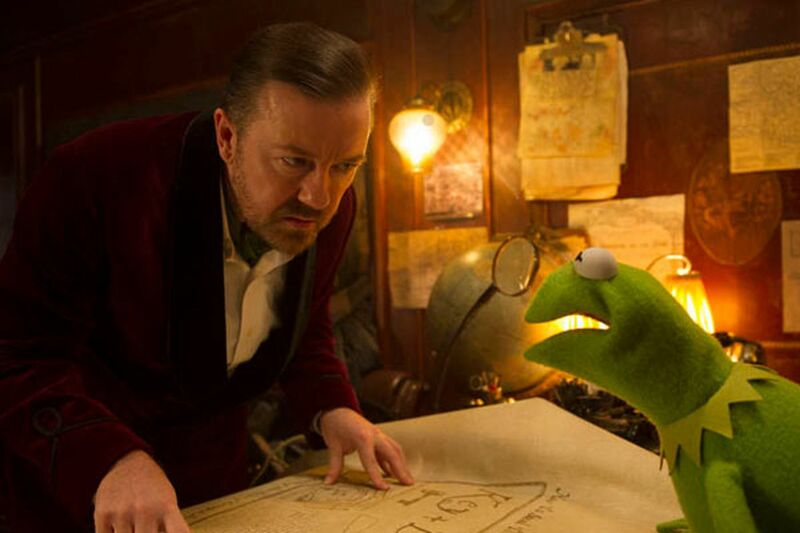 Muppets Most Wanted may be their most adult film yet, full of wink-and-nod humor and vintage references. Turns out their new agent (Ricky Gervais) is pulling all their strings and the tour is a ruse to cover up an elaborate jewel heist. Before you can say "Ribbit," Kermit is in a gulag in Siberia where the Slavic wardeness (Tina Fey) runs a tight ship. Meanwhile, the evil look-alike taking Kermie's place on stage has proposed to Miss Piggy! With a couple of exceptions, the songs are excellent, suggesting Ray Davies of the Kinks writing in a vaudevillian style. And the celebrity cameos provide a dependable frisson. Among them, Tony Bennett, Lady Gaga, Zach Galifianakis, Chloe Grace Moretz, Diddy Combs, Hugh Bonneville, Saoirse Ronan, Usher, and Stanley Tucci. Ty Burrell, Jermaine Clement, Ray Liotta and (mais oui) Celine Dion have more significant roles. Sunny and cheerful, Muppets Most Wanted is a cascade of epic silliness, good for a few fleeting and familiar chuckles.